ROSSA will bid to reach the Antrim Senior Hurling Championship final for the first time since 2004 this Saturday when they take on defending champions, Cushendall in Corrigan Park. The Volunteer Cup has resided in the north of the county ever year since Rossa’s win 12 years ago. Remarkably, Cushendall have featured in nine of the last 11 county finals and are aiming for a third title in succession. Last season, the Ruairí Óg’s made it all the way to the All-Ireland club final, losing out to Na Piarsaigh. They fired out an emphatic warning to their Antrim rivals when they recorded a landslide 6-29 to 1-12 win over Creggan in their quarter-final clash last month and Rossa boss Jim Close knows his side will have to be at their very best if they are to have any chance of causing an upset. “Cushendall are a good outfit. 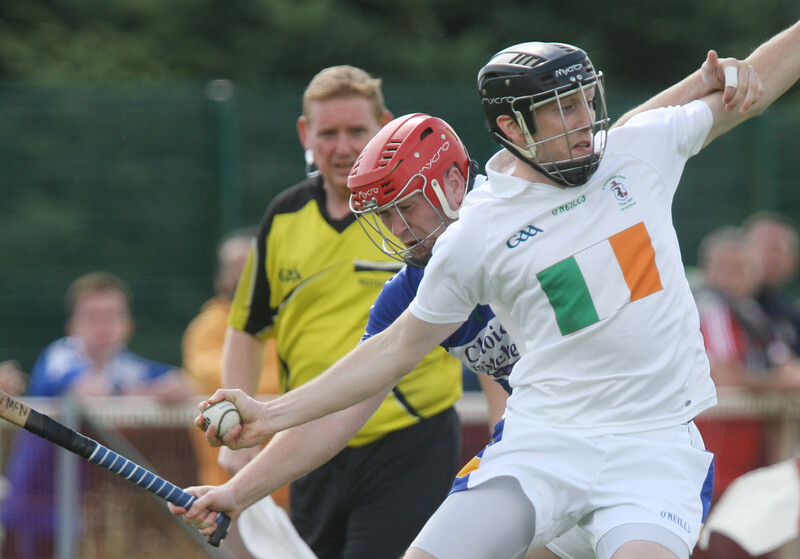 Unfortunately Creggan were on the wrong end of it – they just kept motoring and they hit 35 scores,” said Close. “We need to be at the top of our game to overcome these boys. “We have to have to bring intensity to the match and put in the hard tackles and the hooks and blocks. “That goes from the full-back to the full-forward – we can’t let them win easy ball. Rossa already have the benefit of two league games against the county champions – although they lost both home and away fixtures. Nothing about the manner of those losses suggests that the Shaws Road can’t be competitive against their North Antrim opponents. Just two points separated the sides when they met back in May (1-16 to 3-12) but Cushendall claimed a 4-13 to 0-16 win when they hosted Rossa in July. Shipping goals undermined Rossa’s chances in the league games and Close knows his charges cannot afford to make the same mistakes on Saturday evening. “Cushendall were quite clinical against us,” said Close. “They have been scoring a lot of goals this year. We matched them in terms of the number of scores but they were getting goals at the key stages of the games. While Cushendall were emphatic winners against Creggan, Rossa were forced to dig deep to edge past rivals St John’s in the last round. A late Paul Close goal helped his side to a 1-22 to 1-18 win and his brother, Jim was pleased with how Rossa grinded out a victory despite not playing to their full potential. “I am sure St John’s are delighted with how they played but we scored 1-22 which should win any game – and it did,” added the Rossa boss. “We just fought hard and kept the workrate up. “I didn’t see much quality coming from us but we did hit a lot of quality scores. Last weekend, Rossa’s footballers drew with Lámh Dhearg in the Senior Championship with dual star Christopher McGuinness coming off the bench to play in the closing stages of the game. Close will be hoping the former Antrim panellist will be fit to play a greater role against Cushendall this Saturday. That football replay has been penciled in for Saturday, September 24 – the day before the county hurling final. “We will have to take it one game at a time but hopefully we can give the county board a headache on that one,” remarked Close when quizzed about the possible fixture clash. Cushendall, however, are hotly fancied to ensure that Rossa will have only one Championship fixture that weekend. The defending champions, who are currently managed by Philip Campbell, have been boosted in recent weeks by the return of Ryan McCambridge and Neil McManus from travelling. McCambridge featured in the win over Creggan while McManus is expected to make his seasonal reappearance on Saturday. Cushendall were put to the pin of their collar last season by both St John’s and Ballycastle, but the Ruairí Óg’s are likely to make it through to yet another county final at Rossa’s expense. The second Senior Hurling Championship semi-final takes place at Glenravel at 4pm on Sunday when Loughgiel take on last year’s beaten finalists Ballycastle.